Mergers and Acquisitions are generally considered as tools of corporate growth that create value and propel corporate efficiency. Nevertheless, the empirical evidence are not consistent. 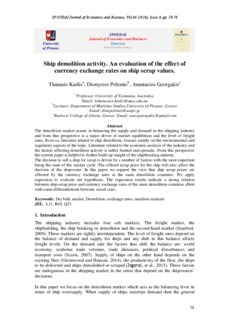 This paper considers maritime corporations that participated as acquirers in completed M&As between 1998-2009. As far as the authors are aware, such an analysis has never been undertaken for the maritime industry although such an analysis will greatly assist maritime financial decision makers in formulating their decisions. The methodology of our analysis is based on utilizing profitability and enterprise value as measures to investigate the profitability performance of the acquirer following the acquisition. In addition we also examine enterprise value shifts in order to investigate how the decision to proceed with the acquisition was perceived by the investors. Our results indicate a decline in the profitability of the acquirer and there were no statistical significant evidence that the enterprise value of the acquirer increased between pre and post-merger period.